Introduction to Sport Law With Case Studies in Sport Law, Second Edition, provides students with comprehensive information on the fundamental legal issues in sport and sport management using a jargon-free approach that is accessible to readers with little or no legal background. The content covers legal and management matters most commonly found in sport management, including liability issues, protecting the legal rights of athletes and employees, and managing legal risk. These texts contain straightforward examples and case studies that deliver timely information to ground sport law theory in practical applications. Fully updated and expanded, Introduction to Sport Law, Second Edition, helps students understand the types of law that are most relevant to sport management professionals. New references and updated court cases throughout the text allow students to see laws and issues from a contemporary point of view to further their comprehension. A new chapter on labor law adds a current perspective for students and sport management professionals. 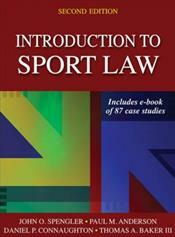 ... Introduction to Sport Law With Cases Studies in Sport Law, Second Edition, presents a comprehensive examination of legal issues in sport. Through its focus on legal concepts with direct application to the sport manager's role and a presentation devoid of legalese, this text provides readers with the information they need in order to feel confident with the fundamentals of sport law.